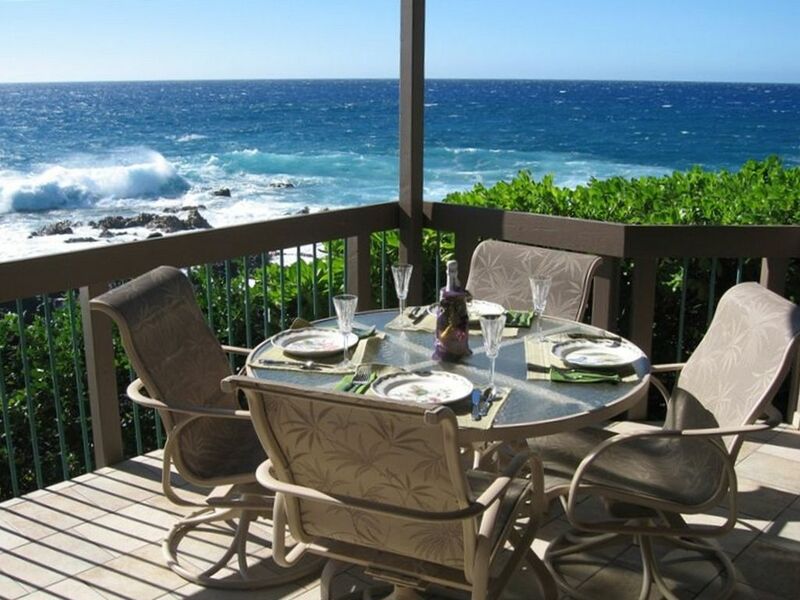 OCEANFRONT CONDO - As Kona residents for 25 years, our desire is to share ALOHA. This is your opportunity to Experience Tropical Paradise, spectacular sunsets year-round, spouting whales in winter, and frolicking dolphins. This secluded and prestigious 18 acre Resort is surrounded by the Pacific Ocean, Keauhou Bay, and world class golf courses, and only minutes to the best snorkeling on the Big Island. Two lighted tennis courts and three pools with spas are convenient for your enjoyment. A gated security provides privacy and tranquility. Unobstructed views abound from this spacious 1700 square foot unit, complete with lanai wet bar; large master suite with king-size bed, and granite double shower enclosure for two. Bruce and Janice, retired teachers, grew up in Salem, Oregon Both graduated from Oregon State University in Education, Janice in Elementary and Bruce in Secondary, History and Science. Two married sons and seven wonderful grandchildren. We chose to buy our vacation rental, because our dream had always been to live in Hawaii. As the time neared, we decided that Kona was the place for us. We felt it had the most desirable weather, fishing, and most harmonious cultural blend. We felt the community desire was to work together for the best interest and welfare of all. Living on the ocean revives the soul and spirit. We initially were attracted by the beauty of our ocean, magnificent sunsets, lush tropical plants and landscaping. The cultural activities of Hawaii, being hula or ukulele to name just a few, are available for all. There are so many activities available that it is difficult to choose. The Hawaiian culture is gracious, generous, humble, and willing to share the beauty of their heritage. Bathrooms recently remodeled with granite shower and granite tub enclosure and walk in shower walls, porcelain tile flooring and refinished koa wood cabinets and accessories. Oceanfront, Views from all rooms, except bathrooms. Beautifully manicured grounds provide serenity and a wealth of color with tropical foliage. Available as a $30. per day option. Convenient dining on Lanai or indoor dining area. Netflix streaming at No additional charge. Beautifully landscaped property and common areas. We had a wonderful stay at our water front Kanaloa condo. We ate most of our meals here because the view is better than any of the restaurants in town. There is no road noise and rarely a sound from another person. This unit is nicely appointed with many extras like kitchen supplies, all the beach toys we needed and even binoculars for whale watching. It is just a short walk to the ocean view swimming pool and a very short distance to the outdoor gas grill. I can’t imagine a better place to stay on the Kona water front. This was definitely the nicest condo we have ever stayed in - the cleanliness and the attention to detail were impressive plus the furnishings were in excellent condition. The oceanfront views were spectacular. We even saw whales from the lanai! We hope we can return to this beautiful condo sometime in the future. We had a wonderful vacation and it has been a pleasure working with the owners who were extremely prompt and kind in responding to inquiries. 1. Oceanfront property with amazing views and soothing sound of the ocean waves – definitely yes. 2. Immaculate two bedroom condo with fully equipped kitchen, washing machine and dryer – definitely yes. 4. Would I book this condo again – absolutely yes! I highly recommend this property for all of the above reasons. Mahalo Janice and Bruce for sharing your beautiful condo. We are pleased that you have chosen to stay with us during your recent visit to the Big Island of Hawaii, and we feel blessed to be able to share our little corner of paradise with you. We try to anticipate the needs of our guests, and we are so pleased when our efforts are appreciated. We do look forward to your return. Extremely well maintained and great view! We have stayed several times at different condos at Kanaloa. This is probably the nicest, best stocked, and cleanest ones we have rented at Kanaloa. Excellent location on the water. Will definitely stay at this one again. Janice was also very helpful prior to our arrival. We wanted to give a glowing review of our recent mid-July stay at your Kanaloa #1802 Condo. Access to all the included amenities of home enhanced our experience. Found everything we needed and well stocked that helped to make our stay exceptional. The condo is very spacious and well laidout. The new window coverings you added created wonderful warmth to the place and made it all the more ‘homie’ to us. The close proximity to the water was wonderful and we loved spending time simply relaxing on the lanai seeing and hearing the waves crash. Plenty of activity on the water in the way of tour/fishing boats going and coming, and the ever present outrigger canoes racing each other or individual kayaks gliding by. Even had an opportunity to view some of Kona’s Spinner Dolphins playing about 100 yards away one day. The community grounds are well maintained by a continuous cadre of groundkeepers cleaning and pruning to help keep your property clean and inviting on the outside as much as you have done on the inside. We also found that running to the shopping center was so easy since it was only about a half mile away and so convenient. And having a USPS branch there was helpful since we needed to send a package back to the mainland. Had a pizza from Bianelli’s one night and it was wonderful. We got to use the new ‘Saddle Road 200’ via hwy 190 to get to Hilo and Akaka Falls, etc. instead of the long way via hwy 11. Very fast and safe now. And the new Ali’i Dr.extension/bypass makes it so quick to head down to Captain Cook or City of Refuge area. So many changes I’ve seen since 1980 when I first started visiting the island. It continues to grow. We appreciate all you did to make our stay so memorable. We appreciate your kind note so very much. Thank you for choosing to stay with us. We enjoy sharing our little corner of paradise with you and others who are so appreciative of our efforts. We do look forward to your return. Special blessings to You and your family. Big Island Revealed is provided in your unit. All Rates Subject to Hawaii Excise Tax & Hotel Room Tax. #113-956-0448-01 Rates are Based on Four Guests Cleaning fee of $150.00 Note: Until confirmed, rates may be subject to change. Central Air conditioning is available for an extra daily fee.